It’s very hard to believe and somewhat difficult to come to terms with, but my mother turned eighty a few days ago. Where have the years gone? 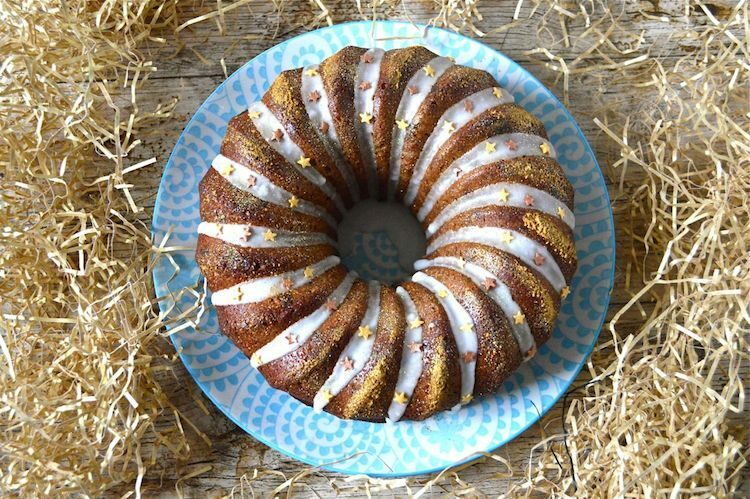 To celebrate, we went out for lunch with a few friends and I made this fig lemon marzipan bundt cake. Every year I mean to mark Twelfth Night by making a special cake and every year I manage not to do it – until now. When it comes to cake, I associate Twelfth Night with marzipan, so although I didn’t intend to make a traditional King Cake or similar this year, I did want to include almond paste. And as I still had plenty of lemons left from my 3pFruits box, lemon marzipan cakes it was to be. Who doesn’t love a good Easter egg hunt? Well, I’m not actually sure I’ve ever been on one, but I love the idea and I’ve certainly witnessed a few with the excited squeals of children ringing in my ears. So when I was asked to create an Easter recipe for Sainsbury’s, I thought I’d hide a few Easter eggs inside some cupcakes. I give you my surprise Easter Egg cupcakes flavoured with almond and lemon. Whilst so many are caught up in football fever, lets not forget another sporting epic which will soon be hitting our very own shores. Yes indeed, the Tour de France kicks off in Yorkshire this year and as this is only the fourth time the UK has hosted the race, I suspect that Up North they might be even more excited about this than they are about the “Beautiful Game”. Somewhat surprisingly, as it is a little out of the way, one distinguished Tour de France competitor recently made his way to my door. He was such a charmer, I couldn’t help but let him in. Although he wore a medal proudly around his neck and sported a very jaunty yellow jersey, he didn’t boast of his prowess once during his stay. In fact he watched over us for several days, in a sometimes excited but friendly way, ensuring we wouldn’t forget the upcoming race. Then one day he just disappeared. Actually he disappeared over several days as he was rather large, weighing in at 400g. He was also quite delicious, made as he was from Bettys Swiss very moreish grand cru milk chocolate and coated with sweet luscious marzipan creating the prized maillot jaune or yellow jersey. The coveted yellow jersey has never tasted batter. It just so happens that the finish line of the first stage is at Harrogate, home of Bettys, the famous tea rooms and chocolatier. When they discovered that 1919, the year of their founding, was the same year the yellow jersey was introduced, the idea for the 1919 Victory Bear was born. Wearing hat, riding goggles and a spare inner tube strapped across his chest, he looks the epitome of intrepid, debonair sportsmanship. The 1919 Victory Bear is joined by a whole host of limited edition cycling treats all with a Bettys twist. Retailing at £29.95 this is a must for any cycling enthusiast or even just those partial to cute chocolate teddy bears. Thanks to Bettys for the chocolate Victory Bear. There was no requirement to write a positive review and as always all opinions are my own. 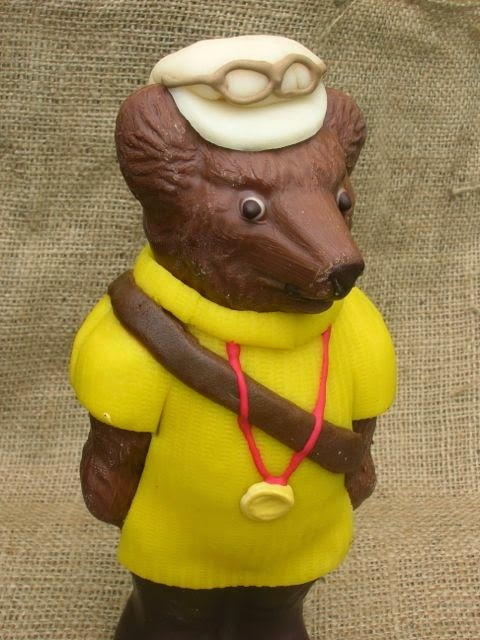 To get into the spirit of the tour de France, Betty’s have kindly agreed to allow one lucky Chocolate Log Blog reader to win their very own 1919 Victory Bear. To be in with a chance of winning, please fill in the Gleam widget below. You will need to leave a comment on this post, answering the question, which then gives you additional chances to enter if you so wish. Gleam will pick a winner at random from the entries received. If you are commenting anonymously, please give me some way of identifying you as I will be verifying the validity of entries. Any automated entries will be disqualified. This giveaway is only open to those with a UK postal address. Winners will need to respond within 7 days of being contacted. Failure to do this may result in another winner being picked. Prizes are offered and provided by Bettys and Chocolate Log Blog accepts no responsibility for the acts or defaults of said third party. I do love a good macaroon, so when I was hunting around for a K for this month’s Alpha Bakes, I was delighted to find these kransekake (otherwise known as marzipan macaroons) in Scandilicious Baking by Signe Johansen. Until I found this recipe, I had no idea that almond macaroons were a Scandinavian speciality. I’ve always thought of them as very British, that is until the sophisticated Parisian macaron came along and swept all before it. Luckily, rustic macaroons are much more my style, I say that as I’d never have the patience to create the elegant structures beloved by the French. If you’d like tips on how to make the perfect macaron, hop over to Jill’s blog, Mad About Macarons. Anyway, I digress. These macaroons contain marzipan as well as almonds and can be finished off in any number of ways. I chose to use a chocolate drizzle; the only thing that can improve macaroons or marzipan in my book, is chocolate. The bitterness of dark chocolate helps to counteract the sweetness of the macaroon resulting in a nicely balanced biscuit. Melted 50g unsalted butter in a pan and left to cool. Broke 3 duck egg whites into a bowl and whisked briefly with a pinch of salt and a scant teaspoon of vanilla extract. Whisked in the melted butter. Stirred in the almond mixture. At this point I realised my mixture was too wet – I had used duck eggs rather than the medium hens eggs stated. So I added 50g ground almonds. Placed in the fridge to chill for a couple of hours. Placed large teaspoonfuls on two lined baking trays – I made 20 but as the recipe stated 40-50, I suspect the macaroons were meant to be a lot smaller than I made them. Baked at 200C for 7 minutes until just golden. Much to my annoyance, the biscuits had all merged into each other, although it was my own fault for not leaving the suggested space in between each one – something I never seem to learn. So I took out a cutter and used this to shape the macaroons into presentable rounds, then left on a rack to cool. I reckon from the amount of offcuts I had, I could have easily made another five or six biscuits. Melted 30g dark chocolate and drizzled it over the macaroons. Apart from my spacing disaster and ending up with two very large biscuits which I then had to rescue, I was very pleased with these macaroons. The end result looked perfectly respectable. I shall definitely make them again and take more care next time with both size and spacing. They were chewy, flavoursome and the larger pieces of nut gave added texture. It is Coeliac Awareness Week starting today (13th-19th May) and these biscuits are perfect for anyone unable to eat wheat or gluten as long as the marzipan and chocolate are properly gluten free. Some products may contain traces of gluten if they come from factories where gluten is used, so it is always worth checking the packaging. 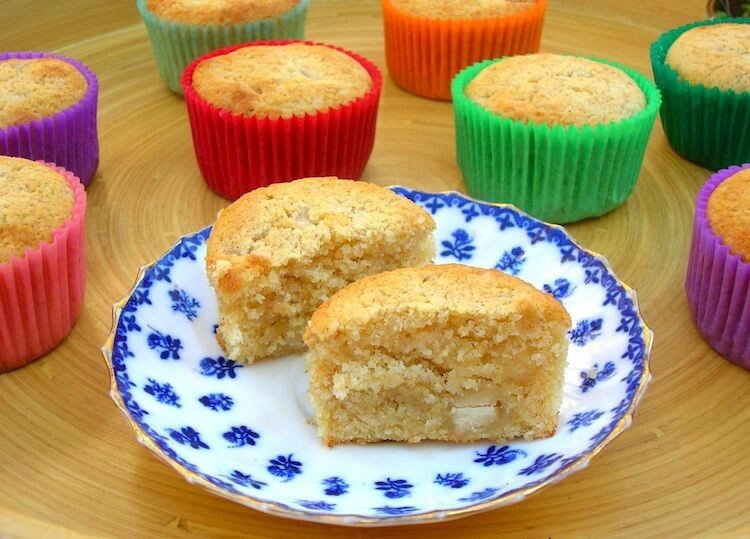 For more information on gluten free baking, pay a visit to Katie’s blog Apple and Spice. I am sending these marzipan macaroons off to Caroline Makes who has chosen K for this month’s AlphaBakes and K is for Kranskake. This monthly challenge is hosted alternately by Ros of The More Than Occasional Baker. I am also including these in that monthly groaning table of goodies which is Teatime Treats. Karen of Lavender and Lovage has chosen the biscuit tin and cookie jar as this month’s theme and my macaroons filled up my biscuit tin very nicely. The challenge is alternately hosted by Kate of What Kate Baked. Classic French, the monthly challenge from Jen of Blue Kitchen Bakes is macarons this month. Guest hosted by Victoria of A Kick at the Pantry Door, I think I might be winging it with these Scandinavian macaroons, but a girl has got to try. Now what do you do with 100g of delicious handmade marzipan left over from making your simnel cake? Well, brownies of course – specifically Easter brownies. I’d had a look at Paul A Young’s simnel brownies, but although I really must try that recipe at some point in my life, I didn’t feel now was it. Possibly the best ever brownies I’ve yet made are those from Pam Corbin’s most excellent of books Cake: River Cottage handbook no 8. I still haven’t managed to post about them, so I’m posting this adapted second version first. Melted 185g dark chocolate (100g with cranberries, 85g of 85%) with 185g unsalted butter in a pan over a low heat then left to cool slightly. Whisked 3 duck eggs with 275g sugar (175g vanilla caster & 100g dark molasses) using an electric whisk for a good 5 minutes until thick and doubled in volume. Folded the chocolate into the eggs. Sifted in 85g wholemeal spelt flour, 40g cocoa powder, 1 tsp cinnamon and a good grating of nutmeg. Folded it all in together. Gently stirred in 100g of marzipan I’d cut into small cubes. Spooned into a 9″ sq cake mould and baked for 27 minutes at 180C. Cut into 16 squares and pressed a mini chocolate egg onto the top of each one. Nothing much to say except mmmmmmm!! And I will most certainly be making these Easter brownies again. AND they are so quick to make, you still have plenty of time to whip some up for Easter tea. I hope you all have a very Happy Easter and don’t forget to enjoy your chocolate. Every month Kate of What Kate Baked and Karen of Lavender and Lovage take turns hosting a tea time treats event where it’s usually very hard to resist virtual overindulgence. I am submitting this to the massive Easter party hosted this month by Kate. It’s Easter and I haven’t made a simnel cake for a couple of years, so it just seemed the right thing to do. Last year I made these Amaretto cupcakes decorated with crystalised primroses which were delicious, but just not quite the same as a proper Easter simnel cake – I do like my traditions. When Dom of Belleau Kitchen asked me to pick a number for his always exciting Random Recipes challenge, I was away from home and unable to follow his exact instructions – that’s my excuse anyway. So instead of counting my books, I picked my lucky number 17 instead. It seems that any blame for what you get sits on my shoulders this month – nice one Dom! As Dom had honoured me by getting to pick the special number, I thought I really ought to try and do this challenge without cheating. NOT, I hasten to add, that I normally cheat; I’ve just interpreted the challenge to refer to my chocolate cook books only. But not this time, I was going to be intrepid and include all of my many cookbooks scattered around the house, open a page randomly and then take the first chocolate recipe that followed from the page I landed on. If, I reasoned, I got a book that had, god forbid, no chocolate recipes, I would move on to the next book. Hoist by my own petard. No. 17 for me was Low-Carb Vegetarian by Celia Brooks Brown. Being a bit of a carb junkie, this book has been languishing on my shelves for many years largely unused. 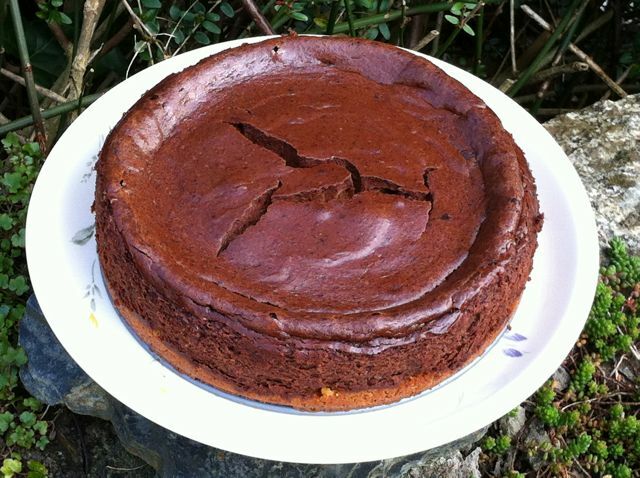 And what I got was something that sounded really quite strange – chocolate marzipan cheesecake. It doesn’t seem like an obvious match made in heaven, but I love marzipan, I love cheesecake, so why not? CT also loves cheesecake and as he is going through a particularly tough time of it, I was hoping that this would be a welcome treat for him. Reading through the recipe, I was rather dubious about a couple of things, both revolving around a loose-based cake tin. As some of you know, I’m a big fan of silcone moulds which has really made baking life sooooo much easier. I used to be put off by having to line tins, it just seemed one step too far. Now I don’t even think about it – not very often anyway. Cheesecake I felt really couldn’t be done in a silicone mould so I’d have to chance it using the stated tin. Firstly it didn’t say anything about greasing or lining the tin, so I hoped that only greasing it would be OK. Secondly, I was worried that the butter would just melt and leak out all over the oven. I did prepare for this eventuality by putting the tin on a baking tray just in case. Melted 50g unsalted butter in a medium sized pan. Added 100g ground almonds, 2 tbsp Rapadura (my chosen sweetener), a pinch of Himalayan pink salt and a couple of drops of almond extract. Mixed together than pressed down into a buttered 20″ round loose-based cake tin. Placed in the fridge to set. Melted 150g Green&Black’s dark 72% cooks’ chocolate in a bowl over hot water and left to cool a little. Threw 250g mascarpone, 250g cream cheese, 2 duck eggs and 6 level tbsp of Rapadura (my chosen sweetener) into a bowl and beat with electric beaters until all combined. Spooned the mixture over the marzipan and levelled the top. Baked at 150C for 50 minutes. I was quite right, the butter leaked out all over the baking sheet. The top also cracked, not nice delicate cracks, but great fissures that really didn’t look very attractive. But it did come out of the tin without sticking too much and it was really quite delicious, in fact very delicious. The filling was smooth, creamy and comfortingly chocolatey. The base was chewy, slightly almondy and really rather nice. The two made for quite a delightful contrast and certainly didn’t detract from each other’s flavours. CT was very well pleased with it and it kept him going for some time. Having heard so many horror stories about baked cheesecakes, I am really thrilled how well this turned out – what are a few fissures between friends anyway? And as this is the month of mad March baking and contains Marzipan and Mascarpone as main ingredients I am also submitting this to the second ever Alpha Bakes where the letter is M. This is hosted by Caroline Makes this month, but alternates with Ros of The more than occasional baker. When Chele announced that apples were the special ingredient for this month’s We Should Cocoa, my heart sank a little. I have made so many chocolate cakes and puddings with apple this autumn already I was hoping for something a little different. But, hey, this is a challenge, so I had a little think and realised I didn’t need to bake another cake or a pudding after all. No indeed, I would make up my very own apple and chocolate Danish pastry. I know I could have made my own pastry and made my own marzipan, but time was short so I cheated a little. Poured 100ml water into a small pan and added a couple of inches of cinnamon stick, 1 tbsp of vanilla sugar and a squeeze of lemon juice. Peeled, cored and sliced 1 large Cornish cooking apple. Added apple slices to the pan and simmered for about 2 minutes – trying not to overdo them so they turned to mush. Removed apple slices with a slotted spoon and left to drain. Simmered the syrup for a further 3 minutes to thicken it. Rolled out a pack of 375g all butter puff pastry into a large square. Cut off the edges to neaten the square, then cut into 8 rectangles. Squidged the edges into a ball and rolled out into another rectangle, making 9 in total. Placed a large square (from a 125g bar with 10 squares) of 70% plain Ecuadorian chocolate on each rectangle. Cut a 200g block of marzipan into 9 pieces and rolled into rectangles slightly smaller than the pastry ones. Placed these over the chocolate and pressed down into the pastry to seal it so the chocolate wouldn’t leak out – or at least that was what I was hoping! Laid three apple slices across the top of the marzipan. Scatter some flaked almonds over the top. Baked at 200C for 15 mins until risen and nicely browned. Immediately brushed the tops and sides with the syrup. Transferred to a wire rack to cool. Well it seems with marzipan, you either love it or hate it and many of you hated it. I’m beginning to think that Chele and I are playing good cop, bad cop, with Chele definitely being the good cop. Luckily, some of you out there love marzipan as much as I do – what a relief – and although entries to this month’s We Should Cocoa challenge were slow in coming forward, there was a sudden rush at the end, so I’m pleased to report there is more than just my entry this month – 17 in total. Again, there is a diverse range of offerings and a lot of creative talent – it’s not all simnel cake by any means, in fact there isn’t a single one. Many even made their own marzipan. Thank you to all who took part. I shall be be in my usual quandary, wondering which one to make first.